Celebrity chef Omar Allibhoy breaks it down. The metropolitan cities of India like Mumbai and Delhi may play host to a wide variety of international cuisines, but there are still some that are not easily available. For example, we often find ourselves craving beautiful Spanish flavours; especially tapas. But our tastebuds can look forward to some respite from this near constant pining. UK television’s darling chef, Omar Allibhoy, who is known to create a tapas revolution in England, will be coming to the country soon to host two one-night only dinners—one at Mumbai’s JW Marriott in Juhu and the other at Delhi’s Pluck at Pullman New Delhi Aerocity. As he gears up for his special nights, we got the celebrated chef to talk about his love for the Spanish appetisers, and share his ultimate guide to summer tapas with us. Scroll on for all the details. 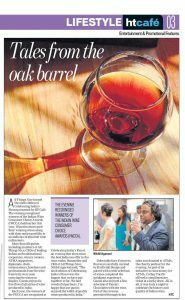 The cheer was on as All Things Nice hosted the sixth edition of Celebrating India’s Finest, an evening recognizing winners of the Indian Wine Consumer’s Choice Awards. 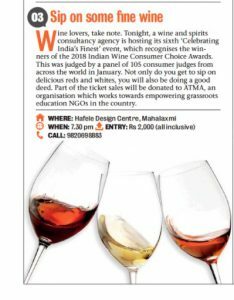 Taste some of India’s award winning wines, handpicked by an audience of consumers at Celebrating India’s Finest 2018 presented by All Things Nice & HT Cafe. 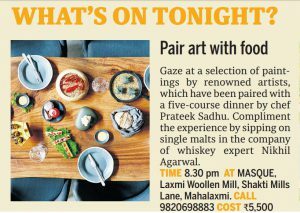 Gaze at a selection of paintings by renowned artists, which have been paired with a five-course dinner by chef Prateek Sadhu. 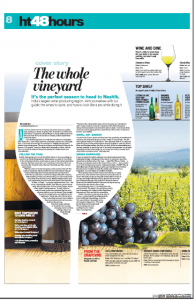 Celebrating India’s Finest’s sixth essay recognises Indian wine awardees | All Things Nice hosted the sixth edition of Celebrating India’s Finest, an event where the winners of the Indian Wine Consumer Choice Awards (IWCCA), held earlier this year, were recognised. All Things Nice hosted the sixth edition of Celebrating India’s Finest presented by HT Cafe. Cigar smoking is still a new concept to most Indians. Here is a breakdown of how to enjoy a good quality roll by Nikhil Agarwal. Once a month, cigar enthusiasts of the members-only Bombay Cigar Club gather to enjoy a fine collection of cigars, paired with alcohol. Each month the group of roughly 150-200 gets together to network, share news on the cigars on the market or simply attend to unwind. 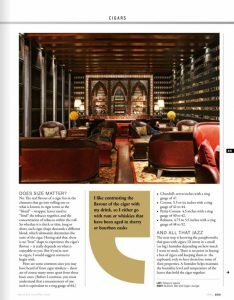 Another is by-invitation-only, The Cigar Club in Bengaluru that meets at least once a week for the same purposes as the one in Mumbai. These are just examples of such closed groups in India; there are several others catering to small groups of like-minded people. 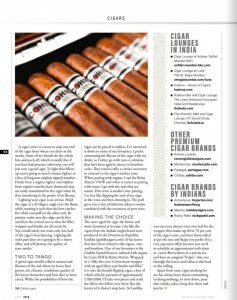 It is a common practice in Delhi for importers of cigars to host high profile events with luxury cigar brands promoting themselves in India. 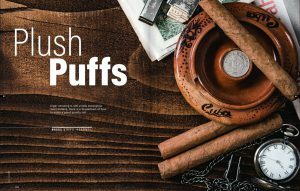 Mumbai-based All Things Nice, a wine and spirits consultancy and events firm too has hosted its fair share of events for with a focus on cigars. Cigars in India is still a niche market, yet a growing trend. In January, The Hindu Business Line reported that about five lakh cigars are bought and sold in India each year, at a market growth rate of 20 per cent per annum. I have observed more curiosity around cigars in recent times than let’s say five years ago. The advent of clubs, lounges and retail stores in the country is testament to this. There is easy availability of cigars, there are cigarenthusiasts, and as time goes on, more people with higher disposable incomes will be drawn to cigars like wine. Plus the old adage of it being limited to sweater-clad men in front of a fireplace is no longer relevant. At some of our events I have had sari-clad women lighting up a cigar with practiced ease, and puffing away on what they rightly recognise as a good blend. 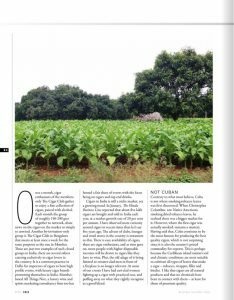 Contrary to what most believe, Cuba is not where smoking tobacco leaves was first discovered. When Native Americans offered Christopher Columbus dried tobacco to smoke, he realised there was a bigger market for it across the seven seas. Where the first cigar was actually discovered, remains a mystery where the. Having said that, Cuba continues to be the land known for producing the best quality cigars, which is not surprisingly also its prized commodity for exports. This is perhaps because the Caribbean island nation’s soil is most suitable to cultivate all types of leaves for the making of cigars — tobacco, wrapper, filler and binder. I like that cigars are all natural products and that no chemicals have been in contact with them — at least for those of premium quality. No. The real flavour of a cigar lies in the elements that go into rolling one or what is known in cigar terms as the “blend” — wrapper, leaves used to “bind” the tobacco together, and the concentration of tobacco within the stick. So whether it is thick or thin, long or short, each cigar shape demands a different blend, which ultimately determines the taste of the cigar. Having said that, there is no “best” shape to experience the cigar’s flavours — it really depends on what is enjoyable to you. But if you’re new to cigars, I would suggest corona to begin with because it’s not too thick nor thin. Here are some common sizes you may have heard from cigar smokers — there are many more apart from these basic ones. Before I continue, you must understand that a measurement of one inch is equivalent to a ring gauge of 64. Churchill: seven inches with a ring gauge of 47. Corona: 5.5- to six inches with a ring gauge of 42 to 44. Petite Corona: 4.5 inches with a ring gauge of 40 to 42. Robusta: 4.75 to 5.5 inches with a ring gauge of 48 to 52. The next step is knowing the paraphernalia that goes with cigars. I’d invest in a small (or big) humidor depending on how much I want to stock. There is no point in buying a box of cigars and keeping them in the cupboard, only to have them to have lose some of their properties. A humidor helps maintain the humidity level and temperature of the leaves that hold the cigar together while imparting taste to it. A cigar cutter is a must to snip one end of the stick from where you puff. Some of my friends do the whole bite and peal off bit, which is totally fine if you have had practice, otherwise you will just destroy a good cigar. To light that fellow up you’re going to need a butane lighter or a box of long non-sulfur-tipped matches. Fluids form a regular lighter and sulphur from regular matches have chemicals that are easily transmitted to the cigar when lit, thus interfering in the purity of its flavour. Lighting your cigar is an art too. Hold the cigar at a 45-degree angle over the flame, while rotating it such that the foot catches fire while you puff on the other end. Be patient; make sure the edges are lit first and then the central area so that the filler, wrapper and binder are all evenly lit. You would not want one half of the cigar’s foot burning and the other not. Lighting the unlit part later is going to be a messy affair, and destroy the quality of your smoke. A good cigar usually has earthy flavours, that of the soil from where its leaves have grown. While the possibilities on how it can be paired and with what is endless, I’ve narrowed it down to some of my favourites. 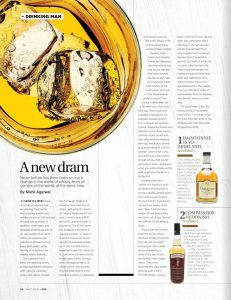 I like contrasting the flavours of my cigar with my drink, so I either go with aged rum or whiskies that have been aged in sherry or bourbon casks. They tend to offer a certain sweetness in contrast to the cigar’s taste. 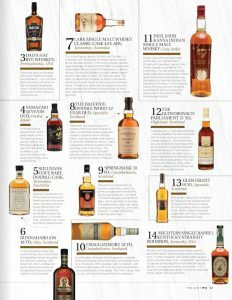 When pairing with cognac, I opt for Rémy Martin VSOP, and when it comes to pairing with wines, I go with the reds that are tannic and suit my cigar and me just fine. Port wine is another nice pairing; I in fact like dipping the end of my cigar and then drawing in. 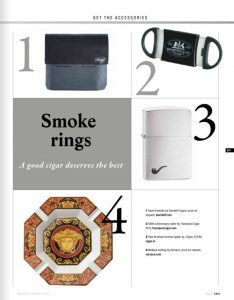 The pull gives you a mix of delicious tobacco smoke combined with the sweetness of the port wine. The more aged the cigar the better and more luxurious is its taste. I do like the cigars from the Indian-origin brand now produced in the Dominican Republic, Gurkha (gurkhacigars.com). It has leaves that have been infused with cognac, rum and bourbon. One of my favourites is the Gurkha Grand Reserve, infused with cognac by Louis XIII by Rémy Martin. 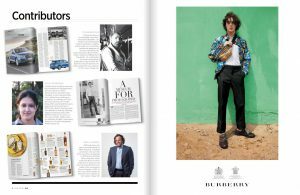 Wrapped in a “silky five-year Connecticut wrapper with an aged three-year binder and filler,” it is also the brand’s flagship cigar, a box of which sells for upwards of approximately US$10,000. I’ll take two please and send the bill to the fellow over there. But the luxury of it doesn’t stop here. At Gurkha, you can even choose your own leaf for the wrapper that makes up 60 to 70 per cent of the cigar’s taste, and have them rolled as per the size and shape you prefer. It’s a very expensive affair because you need to schedule an appointment with them where you’re flown down on a private jet, and have an assigned “helper” take you through the leaves and tobacco that lead to the rolling.